The interface setup depends on the type of LocoNet connection: RS232, USB or Socket. 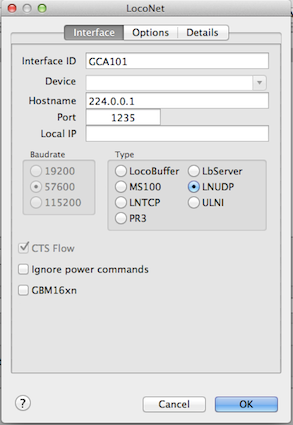 An USB LocoBuffer maps on Windows as a virtual COM-port and on Linux as a USB serial device like /dev/ttyUSB0. The MS100 interface could cause some problems on your serial hardware because of the odd baudrate. A LocoBuffer provide baudrates which are common on all hardware. PR3 (Digitrax PR3) Uncheck the CTS flow option. Some throttles, like the Uhlenbrock IB and Fleischmann Profi-Boss, do not set a throttle ID in the LocoNet packet. Interface address to use if the computer has more then one network card installed. In all other cases: Leave empty. This option should not be unchecked unless the manufacturer advices this to get things working. Unchecking this options can lead to buffer overflows and uncontrolled running trains in auto mode and is therefore excluded from any support. Use with dedicated LocoNet segments with only LocoIO connected. This option prevent sending sub sequential Power OFF/ON commands to avoid unwanted sensor reporting at re-power ON. Specially useful with large layouts. This option has been moved to Command Stations and must be set again. 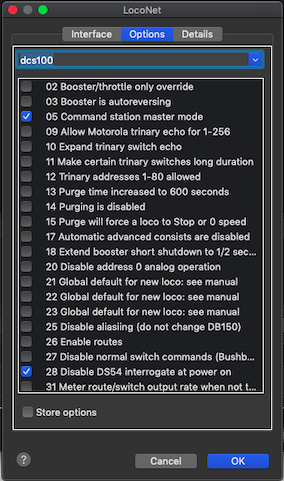 A list of options depending of the Command Station you selected in the combobox. Check your manual for a detailed explenation of the option switches. Options are only available for Digitrax compatible Command Stations. Changes made here can be activated after leaving the RocrailIni Dialog with OK and by checking the Store options checkbox. Select DCS100 if you have a DCS200 because they share the same options. Reset automatically Lissy and RFID events after 1 second. If the CS cannot process a switch command it will respond with a negative acknowledge. If this option is activated the switch command will be resend after 50ms at a max. of 10 times. Number of retries to send the switch command successfully. Number of ms between the retries. After an mobile decoder idle time the LocoNet CS will purge a decoder address automatically. 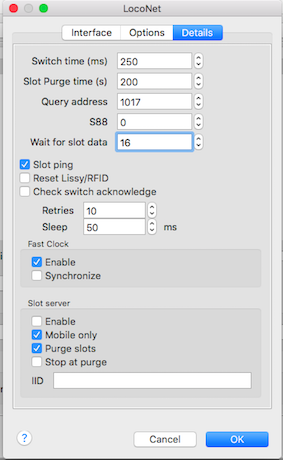 To prevent this Rocrail can ping the respective address before the end of this idle time if the "Slot ping" option is enabled. A value of zero, the CS is supposed not to purge, will lead to unpredictable situations: Rocrail will not check with the CS if the known slot is purged. A LocoNet CS purges¹ to make room for new addresses which make sense if it has only a small stack for concurrently active mobile addresses. ¹) Purging an address will remove it from the DCC refresh stack; so no more packets are generated for this address. The number of seconds to wait for a reply from the Command Station on a slot request. Some LocoNet compatible Command Stations need more time to be able to respond on slot requests, and in that case this value should be increased.